Rogelio's Awesome Guacamole, that is! There are a lot of awesome guacamole recipes out there! 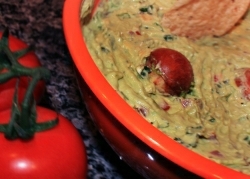 Ok, there is only really one awesome guacamole recipe! That is Rogelio's Awesome Guacamole recipe! Rogelio (Roy) is a personal friend and he makes the best guac I have ever had the pleasure of eating...and I do love guac! He calls his recipe Rogelio's Awesome Guacamole. So I have to agree with him - it is awesome. I would even be willing to issue a challenge to our visitors - send us your guac recipe and we will compare it to Rogelio's. Include a picture and we'll send you a FREE copy of our eCookbook! To be fair, I'm sure that everyone who has a guac recipe they love believes that his or hers is the most awesome guac recipe. So I certainly won't argue. All I will tell you is that I could eat Rogelio's guac every day and not tire of it - it is that good! Try it and tell us what you think. remove pits and scrape into a bowl. onion cream cheese. Blend until smooth. (Use less peppers for less heat). 6. Squeeze in two fresh limes. Hint: The limes help keep the guacamole from browning. Including two of the avocado pits will also help.